2014 was the last year of the Millennium Development Goals (MDGs); however, we are still faced with water-related problems. Moreover, the threat of water-related disasters is tending to increase. The Japan Water Forum (JWF) was called for applications for JWF Fund 2014 to meet the upcoming Sustainable Development Goals (SDGs) and to find solutions to help advance a sustainable global society. JWF Fund 2014 aims to reduce water-related problems to help achieving SDGs. A total of 11 projects in 8 countries have been carried out with the grants from JWF Fund 2014. We are deeply grateful for your understanding and support. ・Project name: Construct ECOSAN toilets on pilot basis in the area and conduct demonstration based advocacy to raise awareness. Maulvi Bazar district is located in the Sylhet region and a significant portion of the population of this area are workers in tea gardens. The water and sanitation facilities for tea worker households are much below the minimum standard and there is much scope for development in this sector. The vast number of tea worker households is living without virtually any proper latrine facility. While low income of these households may be a reason for this, their relative lack of awareness about water and sanitation issues is obviously playing a crucial role for this backwardness. ・1 ECOSAN toilet was constructed. ・5 families are using the toilet probatively. ・Training on operation and management of the ECOSAN toilet for 5 families was held. ・Campaigns ware held at yard meeting and bazaar. ・Session on activity report and suggestion by local reader was held. Mowoh is an isolate, remote and densely populated village, with a population of about 15,000 inhabitants.70% are old, very weak and suffer extreme poverty. 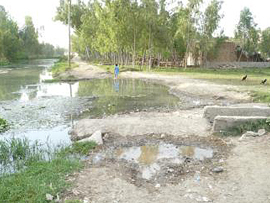 Residents suffer from basic social facilities like access road, sanitation and portable drinking water. 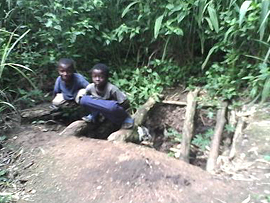 Their only source for drinking water is river Ndongo that flows through the centre of the village. It has a very poor hygiene condition as local resident wash dresses, bath and even defecate upstream causing persistent health hazards. There was outbreak cholera disease in 2010, resulting to 32 dead, 25 were paupers. ・1 biogas pit latrine and 1 deep well and were constructed. ・Beneficiaties were abele to ust biogas for cooking. ・One-day seminar on sanitation and hygiene was held. Livelihood of the majority of households in Tarakeshwor municipality is partly dependent on vegetable farming. For increasing their production, farmers have been using chemical fertilizers and pesticides. In recent days, vegetable are containing high levels of chemical residuals have been destroyed. As a result farmers lose their investment. A public school (Prithvi Narayan Higher Secondary School) in the area lacks proper toilet facilities, especially for girls. 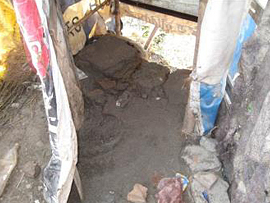 Frequent blockage of toilet facility and lack of water has impaired sanitary condition of the school and polluted the environment. Also, students are lack of clean water drinking and hand washing facility due to non-functional water supply system of the school. ・1 urine diversion toilet and 1 rainwater harvesting tank for hand washing were installed. ・Training on operation and management of constructed facilities for school was held. ・Lecture on utilizing fertilizer for farmers were held. The access to clean water and safe management of human waste – are critical to the health of the community of Tsimelekofe. People are always sick because they are exposed to unclean water and faeces. People drink, wash and cook with water of a pond. 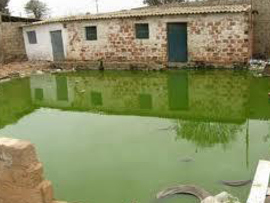 Yet, this pond is source of diseases due to contaminated water. There is a need for clean water. There is also a need to equip the households with latrines so that inhabitants will no more defecate in the open using the surrounding bush as their toilet and prevent them to acquire diseases as a result of unhygienic living environments. 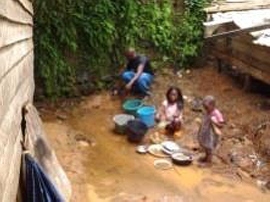 The use of dirty sources of water, lack of water supply and the poor sanitation expose people, especially women and children who are the most affected by infections like cholera, dysentery, diarrhea, intestinal worms and typhoid fever therefore leading to high morbidity and mortality rate in the areas especially in child. ・1 shallow well and 1 ECOSAN toilet were installed. ・Workshops on water and sanitation were held. ・3 WASH programs were held. 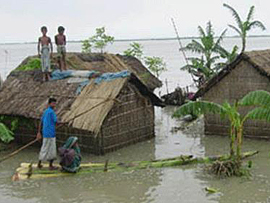 Bangladesh experiences floods almost every year with considerable damage. After floods in each year new land is being generated through accretion. Newly emerging lands are being captured by local power-brokers and the government’s land allocation programme has been implemented slowly. ・Present survey of government and local NGO ware conducted. ・Surver of the coastal flood area was conducted. ・Date of respondents age, level of education, environmental awareness, cultivated areas and disaster losses were collected. ・Analysis of collected date was conducted. Urban flooding is recurring phenomenon that Kolkata faces every year during the monsoon. Kolkata has 2,011 registered, and 3,500 unregistered slums. 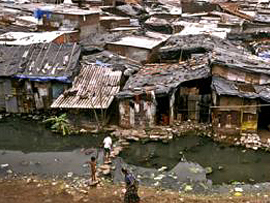 More than a third of the population of Kolkata resides in slums. The increasing population pressure, dense urban environment and low coping capacity of population living in slums make these wards some of the most vulnerable parts of the city. This arises not only from deficiencies in physical infrastructure that lead to flooding but also from problems with land-use, socioeconomic and environmental factors that can aggravate the impact of such flooding. ・Awareness for Slum community and government institutional was held. 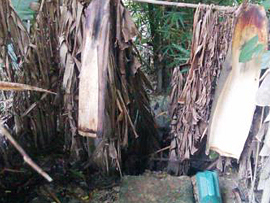 ・Evidence of water-related risks in slum area were collected by using mobile phone. ・ Risk mitigation measures was planed in view of local understandings and needs. ・Capacity Building of youth and residents were implemented. Government School are most vulnerable to “River Godavari Floods” and every year these villages are inundated by Flood Water and closes the School due to inundation and opens after receding the Flood water. School going children face lot of Health Problems in post disaster situation, but government is totally neglecting this due to paucity of funds. The children studying in the school belongs to down trodden communities and do not have financial capacity to address the problem. In addition to the above mentioned, children do not have awareness on water purification methods, safe drinking water, precautionary measures to be followed during disasters. ・Training on water-related disasters for students was held. ・Elevation along school approach Road. was constructed. ・Session with government and students ware held. In this area, lives, crops and houses were lost by flood. In addition that, there are problems that poor water pollution, water quality, drinking water and agricultural water management is not done properly. ・Gathering of public meetings for lunching and introduction of project was held. ・Awareness program for residents was held. ・Training for residends was held to develop linkages with local department regarding the disaster department. ・ Protection walls near the flood vulnerable area in village Nisatta was constructed. ・ 2 disaster risk management teams were established. ・Disaster information center was established in the village. 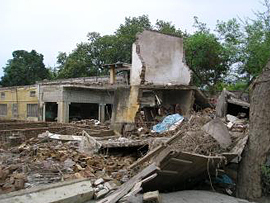 Risalpur area was badly hit by Flash Floods in 2010. Since then, all the focus was on response and recovery by the government and no attention has been paid to the prepardness and mitigation in this area. Negligible structural mitigation methods have been adopted but as far as non-structural mitigation measures are concerned, they have not been taken care of. ・Awareness session on water-related risk reduction for 2 schools were held. ・Exhibition and demonstration of water-related risk reduction ware implemented at local events. ・Seminar of water-related risk reduction for residents was held. 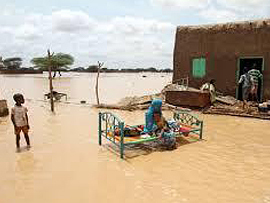 ・Project name: Flood awareness raising among primary school students in the Gezira State, Sudan. Gezira has relatively heavy rainfall of about 350 mm to 400 mm, but the drainage system in the city is very poor. 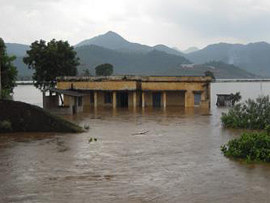 This heavy rain causes flood which damaged the houses, schools, health facilities and the roads. Local government transfer water through tankers to other places out of the city, which create other problems to villages community. Unplanned and immediate cleaning practices to non-designed drainage are currently practiced by local government. ・Lecture on water-related disaster risk reduction for 10 schools were held. ・Survey for target people were conducted. ・Discussion with school principals and Jazeera States parties were conducted. ・Baseline Study on Flood disaster was conducted. ・Meeting with key leaders and extension officers were held. ・Data on disaster vulnerability, impacts, adaptation were conducted. ・ Need assessment on areas of education and training on flood disaster were conducted. ・Awareness among primary and secondary schools were held. ・Education training among members of Community Based Disaster Management Groups were held. ・Disseminations of the Findings on Flood Disaster was held. Caused flood and landslide in 2011, cholera and malaria were spreaded.